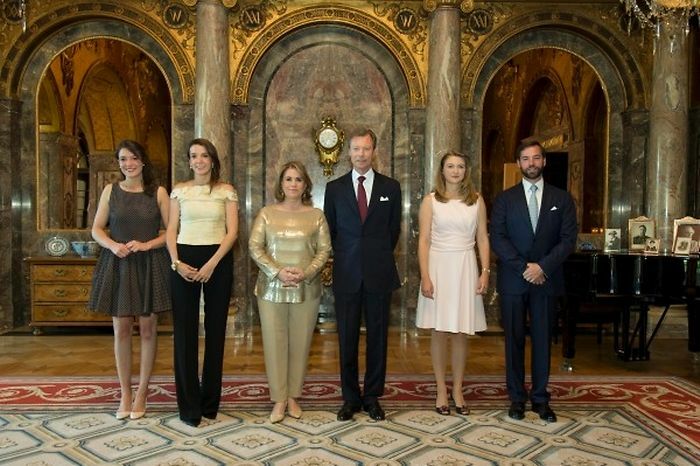 Yes, the British aren't the only one who can host a garden party (though this garden party actually starts inside): The Grand Ducal Family threw the first one of their two traditional national day garden parties today. Grand Duke Henri and Grand Duchess Maria Teresa, Hereditary Grand Duke Guillaume and Hereditary Grand Duchess Stéphanie (wearing Paule Ka once again), as well as Princess Alexandra and Princess Tessy welcomed guests from the worlds of politics, society, sports and finance for a reception at the Château de Berg earlier this evening. Less, yet visible in previous days, the Grand Duchess still seems to suffer from the knee injury she underwent treatment for in September of last year. More pictures of the garden party without the garden at Wort.